Pennsylvania was once covered in land that looked like this, as recent as only a few centuries ago. How could it last, though? Surely, this land was much better suited for development. For progress! Lots of roads and cities, houses and apartments, high-rises and strip malls… lots and lots of strip malls – replete with a Big Lots and LA Nails in every single one. Much of this is gone. Are you sad? Why lament, though? We have stadiums and office buildings, sidewalks, movie theaters, pipelines, and Thai food on every corner. And don’t forget, we do have suburban and city parks, sprinkled with soccer fields, ice rinks, and tennis courts. That stuff is… well, it’s okay… but it’s not real. In those rare moments when you’re not being sold deodorant in a magazine, sold reality in a newspaper, sold financial planning on a billboard…. do you ever stop and think “There’s got to be more to life than this…”? Ever get the feeling that something is missing? That something was taken away from you? Hm… you want it back, don’t you? Well, it’s here. Yep, it never left. That thing you crave… it’s in these pockets of undisturbed reality, where the towering hemlocks, pines, beeches, and birches live. And you know what, you had it not too long ago, and you can experience it once again. The therapist, politician, and 5 o’clock news reporter will never tell you that your heart longs for the reunion between you and land that looks like this. Because well, that’s not good for the economy. You won’t be able to buy anything in land that looks like this. There’s no shopping to be done. 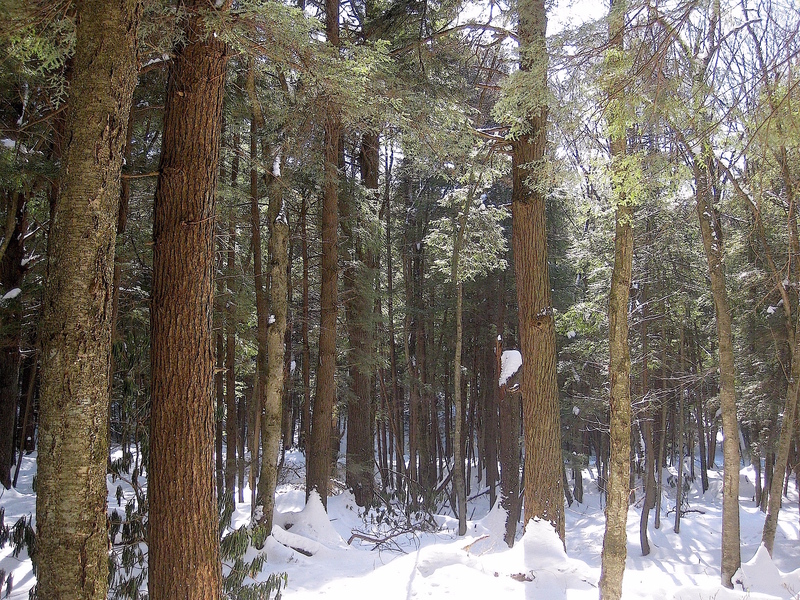 What could an old growth hemlock $ell you anyway? Oxygen? Beauty? Love? Kinda like how you came into this world. And kinda like how you’ll exit: nothing to own, not even your self.